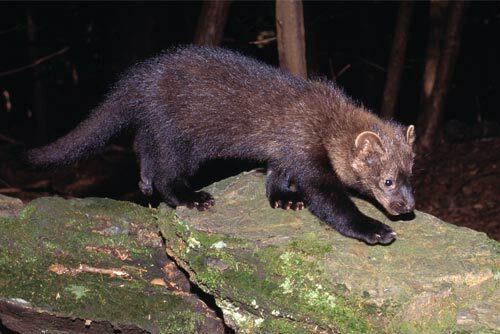 The fisher, also known as the fisher cat, is actually a medium-sized member of the weasel family, and not a feline. Native to North America, fishers are commonly found in the Adirondacks. Male and female fishers differ in length and weight. The male fisher averages a length of 35-47 inches, and the female averages 30-37 inches. The male also weighs more at an average of 7-13 pounds, with the female half that at 3-7 pounds. The most recognizable features include its broad head, narrow muzzle, and long, bushy tail. The dark, long-haired fisher varies in color from dark brown to black, but adult males have a less uniform coloring; they take on a more grizzled appearance with multicolored hairs around the shoulders, neck, and upper back. The short, furry creatures look friendly, but fishers are predators, and they have sharp, retractable claws. Fishers are skilled hunters, and they are renowned for their ability to take down a porcupine. They mainly prey on smaller creatures, such as rabbits, squirrels, mice, and birds, but fishers are omnivores, so they do consume beechnuts, acorns, apples, and berries as well. The history of fishers in the Adirondacks is very similar to the beavers'. Ever since early explorers came to North America, fishers pelts were regarded as a valuable addition to the fur trade market. When Henry Hudson traveled the Hudson River in 1609, trade with Native Americans raised an awareness of the fisher and its potential value. The popularity of the fur trade increased the amount of fisher trapping exponentially. From the early 17th-century until the early 20th-century, a lack of conservation regulations lowered the once prosperous fisher population. Deforestation of evergreen trees destroyed the fisher's main habitat, and new settlements took over their winter hunting grounds and homes. As a result, fishers living in the Adirondacks had a greater chance of survival in more isolated areas away from civilization. The fisher's future in New York took a turn for the better in the mid-1900s. People moved away from farmlands and toward cities, which allowed much of the deforested lands to regrow over the years. Additionally, to help stop the declining fisher population, New York established new regulations to manage fisher trapping. The state actually closed the fisher trapping season between 1936-1949. Current laws forbid fisher hunting, apart from a highly restricted fall trapping season. Any fishers that are trapped require a plastic tag so the DEC can track the number of fishers hunted year by year. Most recently, New York's DEC completed its New York State Fisher Management Plan in December 2015. This plan includes upcoming goals, objectives, and strategies the DEC plans to follow to continue the management and conservation of fishers in New York state for the next ten years (2016-2025). The DEC hopes it can maintain or enhance the fisher population as well as regulate the annual trapping season.